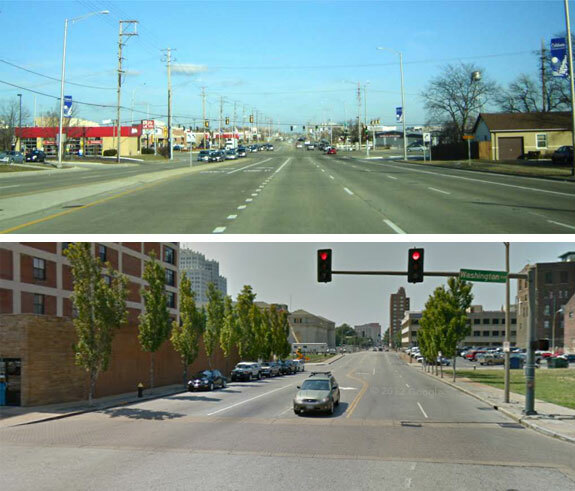 The FHWA applies the same design standards to city streets as to suburban arterial roads. The Federal Highway Administration classifies roads as either “rural” or “urbanized.” But the “urbanized” label is deceptive, because it applies suburban street design standards to any street that isn’t rural. So if you live in, say, downtown St. Louis, the FHWA applies the same standards to your streets as to the streets in Orlando’s most distant suburbs. This contributes to a horrendous mismatch: Many city streets where walking should take precedence are in fact designed for moving massive amounts of traffic. Now there’s a petition drive underway to change that. John Massengale, Victor Dover, and Richard Hall — a team of planners and architects that are involved with the Congress for New Urbanism — are circulating asking U.S. DOT to develop more city-friendly standards. The new standards for Urban Areas would be fundamentally different than the current Urbanized standards. Two-way streets, narrow traffic lanes, bicycle sharrows, and a prohibition on slip lanes and turn lanes would be the norm. In large cities, faster urban routes might be limited to broad boulevards and parkways. Small-town residential streets and Main Streets would be similarly transformed, according to their context. The team calls their proposal a “simple but powerful idea could transform America’s streets and make our neighborhoods, cities and towns more walkable.” As of this afternoon, the petition needs only about 60 signatures to reach the goal of 500 supporters. I don’t think people dying while walking to the grocery store is something that we just need to “accept” about modern life. Although, I live in NYC now I grew up in Cleveland and many neighborhoods in my hometown suffer from poor street design. I hope thtat future planners will think of pedestrians more often and maybe this can help! By the way have we ever done one of those petitions to the white house where they have to respond after X many signatures? Is that a good idea? I get the problem with slip lanes, but why are turning lanes bad? The walkability of cities like NY and San Francisco are overrated. The problem is the streets are too wide, and the speed limits too high. They’re like freeways, or racetracks. Wide streets encourages people to drive fast, which creates more noise and more stress for everyone. Urban streets are designed to move and prioritize car traffic not people. The tremendous noise of the traffic congestion make it a very unpleasant and stressful experience for people who are walking or biking. There is a theory that turn lanes are dangerous. Apparently people are unable to left turn so hence they need to go. I saw one proposal to replace them with U-turn lanes. Which are somehow safer. I’ve also heard about replacing them with roundabouts. I don’t think either is likely. This is well-intentioned, but wouldn’t we all be better served if instead of creating a new category of road, we simply reformed the urbanized classification? Suburbs aren’t going away anytime soon, and most of them are in desperate need of the same design recommendations as proposed for “Urban Areas.” Advocates in dense cities will continue to fight uphill battles for transportation reform until the suburban voters that are kowtowed to start seeing and understanding these improvements in their own communities. I agree with the goal, but I think the method is wrong. There are walkable suburbs as well as walkable city neighborhoods, but this proposed standard would categorize all suburbs as auto-oriented. I believe they say they 80% of all streets are in suburbs, so only a small minority of streets would become safer. Let each city and suburb choose whether it wants to be auto-oriented or walkable. I think that there would be a strong movement toward walkable. what’s the plan for getting goods to the retailers on these walkable corridors? Signed. That is an excellent petition. Take them in small panel trucks. Like they do in every city with a classic, pre-1950s downtown. It’s not a problem. Left-turn pocket lanes are OK, but right-turn lanes are TROUBLE. They end up being very dangerous for people trying to use crosswalks. Florida DOT has formalized the idea that in cities and town centers, roads should be designed differently than in rural places.